Debt Recoveries Australia has the unique advantage of a business relationship with a fully integrated law firm, ADC Legal. ADC Legal are a firm with national reach, they are large enough to be able to offer the resources and depth to respond to the most complex legal needs, yet small enough to be efficient, nimble and responsive. They have extensive experience in the insurance industry, and also have experience in all facets of the commercial sector. At Debt Recoveries Australia we only ever refer files for litigation if we feel all other avenues of recovery have been exhausted. Before referring a file for litigation we go back to the client with our recommendation. 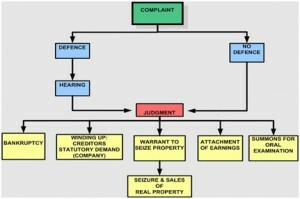 At that stage the client is free to proceed or reject the litigation suggestion based on commercial or other reasons. ADC Legal are eager to get a positive result and will do all in their power to recover the funds owed, their vision is to utilise technical expertise and commercial acumen and offer commercial focused legal advice. But before any of this we use our proven recovery techniques to attempt recovery of the debt without litigation. Even upon referral for litigation to our solicitors we review the file and send out a report with the recommendation. Once litigation is initiated we do not stop trying to recover. We perform routine check-ups on the file and work closely with our solicitors to see what action can be taken. We then keep our client informed on our online system. Our solicitors keep us updated with regular reports and we then upload these reports to our online system. Sending a letter from a mercantile agency can be enough to make many people pay their debts, but for those who don’t pay the idea of receiving legal letters from a national law practice carries even stronger weight. If the need arises that we use these legal letters, we see an increase of payments from debtors. Most people naturally want to avoid legal action, and this may be the prompt to make them pay. Free legal advice on any matters, with no expectation to proceed. When we use our business relationship with ADC Legal to get advice for you, there’s no obligation to issue legal proceedings. Part of the relationship is built on the fact that there are times where we can resolve an issue with some information. There may also be times where the best way forward is by initiating legal proceedings, be it issuing legal proceedings to get the desired outcome or following through with court cases. For all these matters ADC Legal are perfectly positioned to assist Debt Recoveries Australia with recovering your money. For our litigation process you can refer to the image below. Unlike other debt recovery companies we treat every file as though it is our own. This means that if we wouldn’t litigate we don’t recommend that you litigate. This way you can also be assured that our expertise can be passed on to your files and you can feel confident that we are doing the best that can be done to recover on your file. If a matter is litigated, upon the judgment passed on the debtor, most, if not all, the costs can be recovered. In most judgment cases the defendant, or debtor, is required to pay the plaintiff’s legal costs. Whilst we are proud of our relationship with ADC Legal, we also offer the freedom to use your preferred law firm should you have an existing relationship with one. If you are seeking further information on our litigation process you can contact our Principal Solicitor, Nik Fratric.